WASHINGTON — The House pushed ahead on legislation that seeks to punish North Korea for its latest nuclear test by expanding sanctions on Pyongyang, a move with strong bipartisan support despite questions over how effective the new restrictions can be. Lawmakers are scheduled to vote Tuesday on the North Korea Sanctions Enforcement Act, which proposes to deny North Korea the hard currency they say it needs for its weapons programs. Holding the vote tomorrow puts it on the same day as President Barack Obama’s final State of the Union address. But former State Department officials said any new sanctions won’t have teeth unless China makes a major shift in policy toward its rebellious ally. Separately, a panel of experts on North Korea said existing United Nations sanctions against the reclusive country are going unenforced. The House bill is sponsored by Rep. Ed Royce, R-Calif., the chairman of the House Foreign Affairs Committee. The new sanctions would put “targeted economic financial pressure” on North Korean leader Kim Jong Un, Royce said Monday ahead of the vote, arguing that a failure to respond aggressively will embolden Pyongyang. Royce’s committee unanimously approved the measure in February 2015 and it remained there until last week when North Korea announced it had conducted a fourth nuclear test — this one detonating a thermonuclear device with massive destructive power. The announcement was met with doubt North Korea had set off a hydrogen bomb, which would mark a major technological advance for Pyongyang’s limited nuclear arsenal. But it could take weeks or even longer to confirm or refute the claim. Yet lawmakers are pushing ahead. In the wake of the announcement, Republicans derided the Obama administration for not being more forceful in its policy toward North Korea. Royce said the administration’s approach of “strategic patience” toward North Korea has failed to stop its nuclear program. It’s uncertain what the bill’s prospects will be in the Senate if it’s passed by the House. A central part of Royce’s legislation is to make so-called “blocking sanctions” mandatory rather than discretionary as currently permitted through existing regulations. 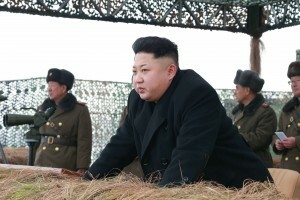 The sanctions are mandated against any country, business or individual that materially contributes to North Korea’s nuclear and ballistic missile development, imports luxury goods into North Korea, or engages with Pyongyang in money laundering, the manufacture of counterfeit goods, or narcotics trafficking, according to the legislation. But Joseph DeThomas, a former senior State Department official who advised on Iran and North Korea sanctions policy until February 2013, said new sanctions wouldn’t force change in Pyongyang unless China is convinced of the strategic consequence of North Korea having nuclear weapons that could threaten America. Due to mounting international concern, the United Nations also is considering new sanctions against North Korea. But less than 40 of the U.N.’s 193 member states have turned in reports on sanctions implementation since the latest round of sanctions was imposed in 2013. Compliance has been lowest in Africa, an increasingly important market for low-cost North Korean weapons sales. Meanwhile, CNN reported Monday that North Korea has detained a U.S. citizen on suspicion of spying. It said a man identified as Kim Dong Chul was being held by the Pyongyang government and that authorities had accused him of engaging in spying and stealing state secrets. In an interview with a CNN correspondent, Kim said he had traveled extensively in recent years between China and North Korea and also had made a few trips to South Korea. In Washington, a State Department official would not confirm the report. Associated Press writers Matthew Pennington in Washington and Cara Anna at the United Nations contributed to this report. Left: Lawmakers are scheduled to vote Tuesday on sanctions to deny North Korea the hard currency they say it needs for its weapons programs. Photo by North Korean leader Kim Jong Un from an undated photo released by North Korea's Korean Central News Agency in January 2015.